A tutorial with plenty of tips and tricks on how to make the best homemade from-scratch vanilla marshmallows. Plus a cute way to decorate them up for Halloween! Growing up, my family drank a lot of hot chocolate. I think pretty much everyone loved it and when it was cold outside – we could each down a few mugs of it. I was the only one who never liked hot chocolate plain. I either had to load it up with tons of marshmallows, wait til they melted, stir em in really well, and then drink it OR eat it with toasted bread. If that bread had jam, even better. Is that weird – to dip strawberry covered toast into steaming hot chocolate? It was my favorite breakfast of choice on an especially cold morning. I don’t think I ever had homemade marshmallows in my hot cocoa growing up, but now I’m not sure I’d like hot chocolate as much without them. Homemade vanilla-flavored marshmallows do absolute wonders to a mug of hot cocoa. It’s pretty much mind blowing! And while homemade marshmallows do have a few steps and take a little bit of time, they are well worth the effort and not too hard to make! So let’s talk through the steps of homemade marshmallow making and then you can be well on your way to the best hot chocolate you’ve ever tasted. Or just the best marshmallows, because we all ate plenty of them plain! The first picture in the collage above is the gelatin + salt + very cold water mixture. It sets up very first in the bowl of your stand mixer. The second picture is corn syrup + sugar + remaining water. The mixture gets combined and stirred until it reaches a boil. Once the mixture is boiling, you’ll cover the pot with a lid for exactly two minutes (use a timer). It may sound a little intense, but it’s important to be very exact when making these marshmallows to ensure they work out and taste delicious! Immediately you will remove the mixture from the stovetop and slowly add it into the gelatin mixture we made at the first. Set your stand mixer on slow as you add in the hot syrup mixture. Once both mixtures are combined, turn the stand mixer to high and let it beat for about 12-14 minutes. Add in the vanilla and beat the mixture for another minute. I like to add lots of vanilla because I like a strong vanilla flavor. If you like that flavor, add as much or even more than the recipe calls for. And if not, feel free to reduce the amount of vanilla to just one teaspoon. Then you are pretty much finished – not bad, right?! Spray a pan (I used a 9 x 13 pan with sides, but if you want thicker marshmallows use a casserole dish) with some nonstick spray. Then you will sprinkle a cornstarch + powdered sugar mixture all over the bottom and sides of the pan – this keeps it from sticking. Pour the mixture into the pan. I like to lightly grease a spatula to help get all of the mixture out and evenly dispersed on the pan. Then I like to use a sifter and sprinkle more cornstarch + powdered sugar over the marshmallows. The only hard part is waiting to eat your delicious homemade marshmallows! You’ll need to wait at least four hours and preferably overnight. (Told you – it’s a hard step!) 🙂 Once the marshmallow mixture is all set up, you can go crazy with fun Halloween cookie cutters (I got mine in a pack at JoAnns),or just cut them up with sharp kitchen scissors. The important thing is that you leave some for those mugs of hot cocoa you are going to want every single morning from here on out until it’s summer time again! 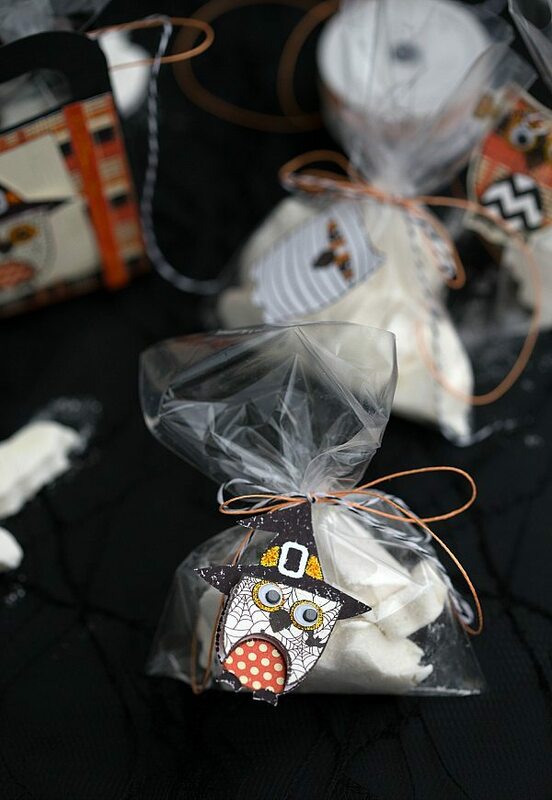 For a fun Halloween treat, you can place the cut-out Halloween shaped marshmallows into a small cellophane bag and tie it up with some festive string/ribbon. In the bowl of a stand mixer, combine 1/2 cup very cold water with the salt and the unflavored gelatin. Stir and allow to sit while you work on the next part. Stick a thermometer in the pan and without stirring, bring the mixture to 240 degrees F or softball stage. Remove from the stovetop immediately. Slowly pour the hot syrup over the gelatin mixture while the mixer is on low speed. Once all of the hot syrup has been poured in, turn the mixer to high speed and beat for 12-14 minutes. Add in the vanilla extract and beat for one more minute. The bowl will get very full and the mixture will be thick, white, and shiny. Meanwhile, spray a 9 x 13 cooking sheet with sides with nonstick cooking spray (For thicker marshmallows, you can use a casserole dish). Combine the powdered sugar and cornstarch. Lightly coat the sides and bottom of the pan with the powdered sugar and cornstarch mixture. Using a lightly greased spatula, spread the mixture evenly on the pan. Lightly coat the top of the marshmallows with the cornstarch and powdered sugar mixture reserving the rest for later. Allow the marshmallows to cool and set up for at least 4 hours and preferably overnight. Then using small cookie cutters or sharp kitchen scissors, cut the marshmallows into small pieces and drop the pieces in the remaining cornstarch + powdered sugar mixture. Shake off all of the excess and store in an airtight container in a cool place. These are best used within one month. GAH! These are TOO CUTE. 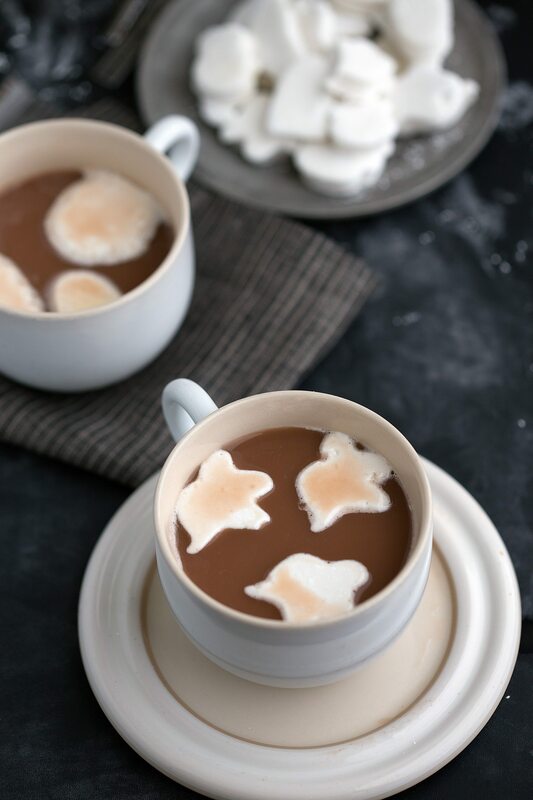 I love hot chocolate and usually try to resist marshmallows, but these? I won’t be able to. Bring on all the adorable, fluffy, homemade goodness! Pinned! Dang these are too cute, Chelsea! I adore marshmallows and they are on my culinary bucket list for sure! Pinned! These are adorable! I loooove homemade marshmallows and now I’m totally craving hot chocolate. So fun! I’ve yet to make homemade marshmallows. Bet it would be fun. These marshmallows are the cutest, Chelsea! I actually just bought some ghost ones yesterday from the grocery store, but these are so much better! Pinning! These are SO CUTE! I’ve never made marshmallows, so I definitely need all of these helpful tips. I love that you could make these in any shape – such a great idea! 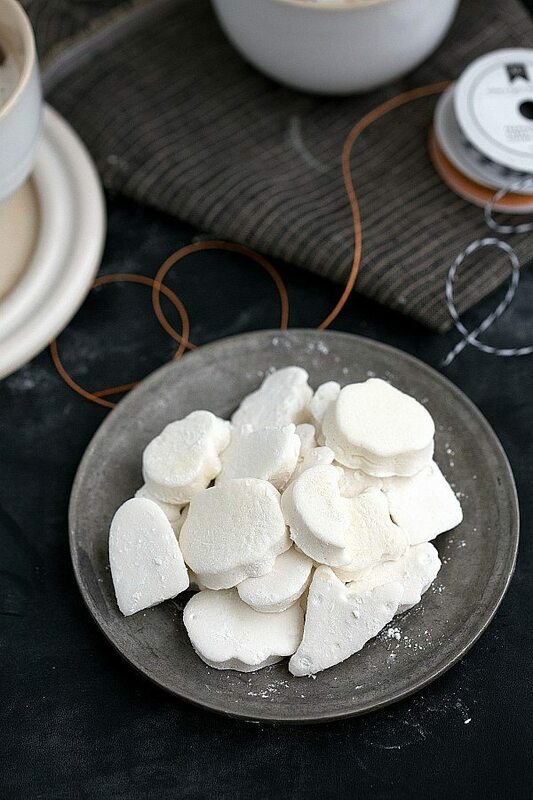 Ooh I have always wanted to make homemade marshmallows – these look fantastic! Your strawberry toast dipped into hot chocolate totally makes sense… It’s like a chocolate-covered strawberry! Only better, because there’s a ton more chocolate than strawberry. 😉 I’m SO impressed that you made your own marshmallows. I’ve thought about doing it for years, but even the idea intimidates me. And they’re totally adorable! Pinned! Chelsea, these marshmallows are SO freaking adorable , I love it! 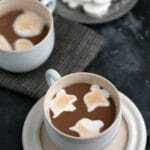 Homemade marshmallows are the best, especially in cute little Halloween shapes! These are so fun. Pinning. I’ve been dyinggggg to make homemade marshmallows and I’m sure they’re especially luscious in hot chocolate! These lil ghosties are so cute! Oh my goodness, this is too cute for words Chelsea! Amazing step by step photos and the idea is genius. Melting ghosts? You rock this food blogging business! These are like the most adorable things ever! I have a million mini cookie cutters I got in a set a few years back. Going to have to dig through to see if there is a ghostie!